To make further changes to the body of your email messages, change the default font or text color for email messages. Note: In Microsoft Outlook 2007, the Organize feature enabled you to create conditional text formatting rules for email messages. 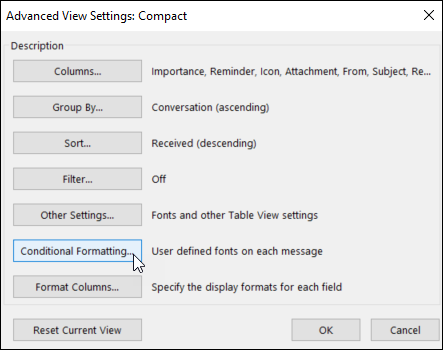 In Microsoft Outlook 2010 and later, conditional text formatting is now accessed in the Advanced View Settings dialog box. On the View tab, in the Current View group, select View Settings. In the Advanced View Settings dialog box, select Conditional Formatting. A set of default rules appears. This includes the Unread messages rule. This rule makes unread messages appear bold in the message list. In addition, any conditional formatting rules that you created in the Organize pane with an earlier version of Outlook appear. To delete a rule, select the rule, and then select Delete. To temporarily turn off a rule, clear the check box for that rule. To change the criteria for a rule, select the rule, and then select Condition. To change the text formatting, select the rule, and then select Font. To add a new conditional formatting rule, select Add, in the Name box, type a name, select Font to specify the formatting, and then select Condition to specify the criteria for this rule. These are some examples of conditional formatting rules that you can create in Outlook 2010. In the From box, type John Kane. Note: The name must exactly match the full name that appears on messages that you receive. In the Filter, Conditional Formatting, and Advanced View Settings dialog boxes, select OK. In the Search for the word(s) box, enter Contoso. In the Search for the word(s) box, type holiday.